A key skill to be mastered by graduates today is the ability to assess the quality of their own work, and the work of others. This book demonstrates how the higher education system might move away from a culture of unhelpful grades and rigid marking schemes, to focus instead on forms of feedback and assessment that develop the critical skills of its students. Tracing the historical and sociocultural development of evaluative judgement, and bringing together evidence and practice design from a range of disciplines, this book demystifies the concept of evaluative judgement and shows how it might be integrated and encouraged in a range of pedagogical contexts. Contributors develop various understandings of this often poorly understood concept and draw on their experience to showcase a toolbox of strategies including peer learning, self-regulated learning, self-assessment and the use of technologies. 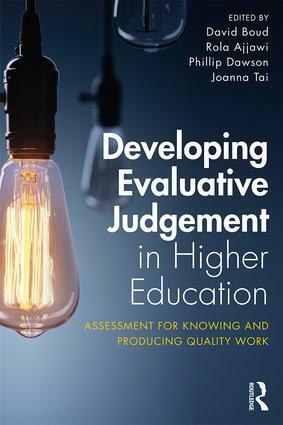 A key text for those working with students in the higher education system, Developing Evaluative Judgement in Higher Education will give readers the knowledge and confidence required to promote these much-needed skills when working with individual students and groups. How do computers make evaluative judgements?